You'll be £12.99 closer to your next £10.00 credit when you purchase Second World War Lives. What's this? The Second World War was a momentous event in twentieth-century history and it is a fascinating period for family historians to explore. Numerous records are available to researchers whose relatives served in the war, and James Goulty's book is an accessible guide on how to locate and understand these sources - and get the most out of them. Using evidence gleaned from a range of sources – archives, official records, books, libraries, oral history and the internet – he reconstructs the wartime records of a revealing and representative group of ordinary men and women: a signaller, an infantryman, a doctor, an artillery officer, a woman serving with anti-aircraft units, a commando, a Royal Navy bomb disposal officer, RAF fighter and bomber pilots, and others. He describes their wartime careers and experiences and demonstrates how they fitted into contemporary military organizations and operations. He looks at their backgrounds, their wartime training and duties, their frontline service, and the conditions they endured. In each case he shows how the research was conducted and explains how the lives of such individuals can be explored – highlighting methods that can be used and sources that can be consulted. rnrnJames Goulty's informative book will be essential reading and reference for anyone who wants to find out about the Second World War and is keen to understand the part an ancestor played in it. ★★★★★ A very enjoyable read covering the WW2 experiences of a selection of men and women from the British Armed Forces. Reading about the experiences of each individual is interesting on its own but this book has the advantage of explaining how the author went about researching the individuals. Useful guidance if you are looking to do your own research. Well illustrated and informative. The Second World War is the most destructive war in history, with an estimated 50 million lives lost. So, without doubt, there is a sense of pride when a family historian discovers information about an ancestor who served in the armed forces. Overall, this book guides the family historian looking for ancestors in the Second World War skilfully through the wealth of possible research methods and options. It is therefore an extremely useful and practical publication. Numerous record are available to researchers whose relatives served in the war and James Goulty's book is an accessible guide on how to locate and understand these sources and get the most out of them. Using evidence gleaned from a range of sources - archives, official records, books, libraries, oral history and the internet - he reconstructs the wartime records of a revealing and representative group of ordinary men and women, This clearly well written book is published in association with The Second World War Experience Centre. Goulty’s book is a work to be enjoyed and to point is towards sound records. Few genealogists can have families untouched by World War II, the most destructive conflict in history in which 50 million people lost their lives. This book tells the story of 13 individuals whose lives were changed by the conflict. They represent those serving in the three forces, but also volunteers and conscripts, and a wide range of social and educational backgrounds. Military historian James Goulty opens the book with a short guide to researching WWII ancestors, but the focus is on these individuals’ stories. 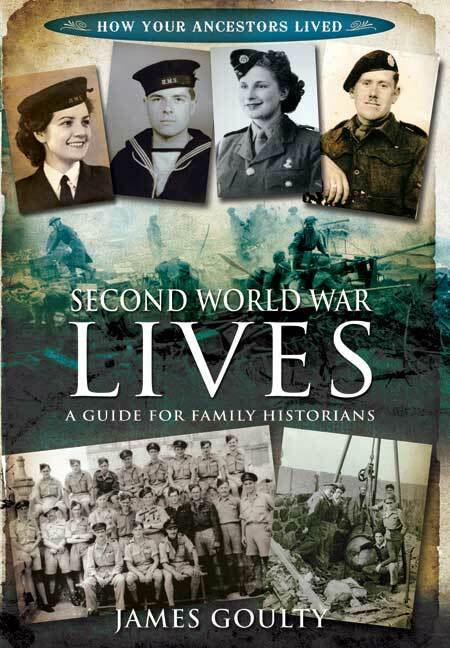 Find out about your World War II relatives’ lives in this comprehensive new guide. James Goulty identifies the key family history sources to consult and uses the case studies of 13 individuals to show ho to use them. A practical guide for tracing military kin, overseas and at home. With the Second World War being the most destructive conflict ever to have taken place, claiming the lives of around 50 million people, the scale of those from all classes and walks of lives employed by, conscripted into and volunteering to work for the armed services is momentous. Equally, it would be hard to find a family historian without a forebear involved in one of the many branches of the military. War historian James Goulty’s book is an effective guide to WW2’s myriad roles, organisations and operation, lightening the task of knowing where to start researching those who served in the war. The book includes case studies reflecting wider participation in all three branches of the services, demonstrates how to use key sources and where to find them, guides the reader toward undertaking more details research and explains how to make most of the major archives, museums and repositories. James Goulty holds a masters degree and doctorate in military history from the University of Leeds. He has a special interest in the training and combat experience of the British Army during the two world wars and Korean War. He has made a particular study of archives relating to the service of individuals during the Second World War, among them the collection held at the Second World War Experience Centre in Leeds.